I made this for the first time last Thanksgiving after finding it in Food & Wine. 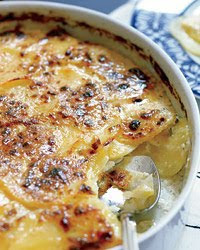 I was so excited to try it out - it's a sophisticated version of your typical potatoes au gratin. I'm looking forward to making it next weekend for Easter because it was less than perfect last fall. The flavor was pretty spot-on (except I FORGOT THE SALT - still can't believe it) - the main problem was that I went for a deeper dish because I wanted to use pretty Corningware instead of a plain ol' glass Pyrex. This weekend I definitely won't be choosing form over function. This side dish really needs to be in a shallow dish so it will cook properly. Plus more surface area means more of that beautiful golden crust that everyone loves. So, what amps this dish up? Thyme, rosemary, and roasted garlic. Oh, and smoked gouda. Wow. So phenomenal. You should definitely add this to the menu for Easter dinner. Or, like me, make this and take it as your contribution to the family meal. And bask in the compliments and awe. ...Or feel completely satisfied at providing such a great experience for those that mean so much to you. Just depends on your point of view. Here's how to make the perfect compliment to your Easter (or any) meal. Preheat the oven to 375°. Cut the tops off of the garlic heads just enough so all cloves are exposed. In a 9-inch cake pan, drizzle the top of the garlic heads with olive oil. Cover with foil and roast for 40 minutes, until tender. Let cool, then squeeze out the cloves. Mash the garlic to a paste and transfer to a saucepan. Add the half-and-half, thyme and rosemary and bring to a boil. Simmer over very low heat until reduced to 3 cups - 20 minutes; season with salt and pepper. Arrange one-fourth of the potatoes in the bottom of a 9-by-13-inch baking dish. Top with one-fourth of the shredded cheeses and drizzle lightly with the garlic cream. Repeat the layering with the remaining potatoes, cheese and cream. Pour any remaining cream on top and press the top layer of potatoes to submerge it. Bake the gratin for about 1 1/2 hours at 375°, until golden and bubbling. Let cool for 20 minutes before cutting into squares and serving. Make Ahead: The gratin can be prepared through Step 3; refrigerate overnight. Return to room temperature before baking. I had a tough time finding Manchego cheese the first go around, and substituted a French cheese that's good for melting. I found it at Costco and can not for the life of me remember what it's called. You're welcome! Point is - sub away, but go for a milder cheese. You want it to compliment the Smoked Gouda, not overpower or compete with it. Have fun dying eggs this week!